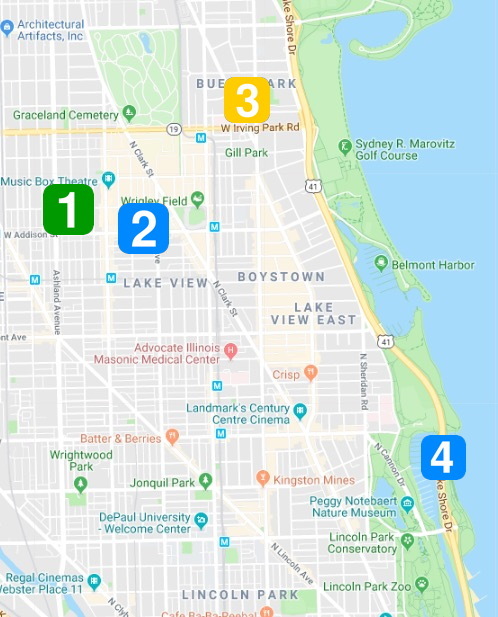 LAKEVIEW — Three men pushed a Lakeview woman to the ground and robbed her around 1:30 Sunday morning in the 3600 block of North Bosworth, police said. One juvenile offender was taken into custody and released to his parents. The other two offenders slipped away. About an hour later, a 23-year-old man told police that he was robbed by two men who offered to sell him cocaine in the 3600 block of North Magnolia. No one is in custody for that case. UPTOWN — Police say a man reported being tackled and robbed on the street in the 4000 block of North Broadway on Sunday morning. Around 10 a.m., the victim was knocked to the ground by a man who went through his pockets and took $20 cash, according to police. The victim described the attacker as a Hispanic man with a bushy beard who stands about six-feet tall and weighs 215 pounds. The robber had curly black hair and was wearing a white t-shirt, jeans, and a silver necklace. LINCOLN PARK — A 24-year-old man who drove himself to Northwestern Memorial Hospital in Streeterville on Sunday evening told police that he had been shot while driving north on Lake Shore Drive near Diversey. Police were unable to find any evidence of a shooting such as broken glass or shell casings near the purported shooting scene. Around 9:30 p.m., the man pulled up to Northwestern’s emergency entrance in a white Jeep Cherokee. He had a gunshot wound to his upper left thigh, and his car had a broken rear window and bullet holes. After initially saying the shooting happened at Huron and Lake Shore Drive, the man later told police it actually occurred in the 2600 block of northbound North Lake Shore Drive following a road rage incident. Police said the victim was in good condition.